I decided to squeeze one more course in before 2016 ended. 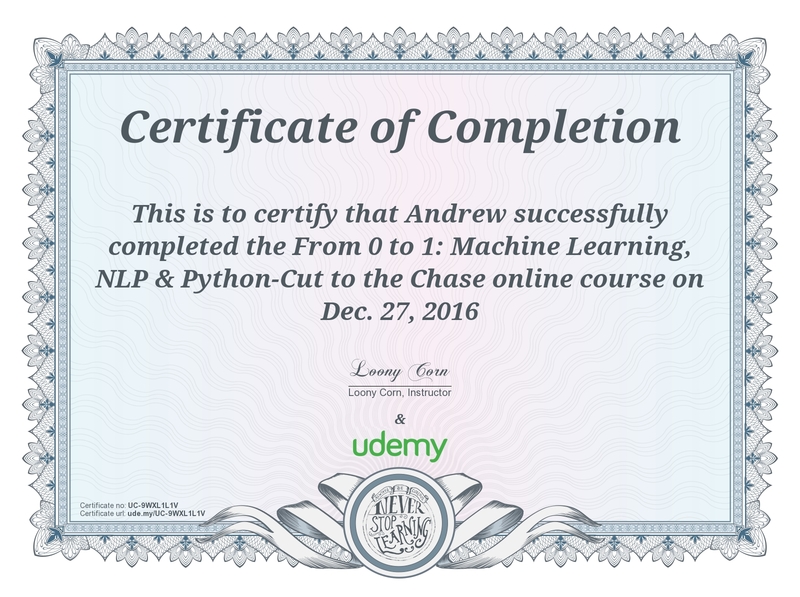 This time I chose "From 0 to 1: Machine Learning, NLP and Python - Cut to the Chase" by the LoonyCorn team on Udemy. This course was a 20 hour overview of machine learning techniques. I've been interested in taking some more formal training on various machine learning algorithms and this course sounded like it would be useful. I was very disappointed in this course. The lessons had large portions of time that overlapped one another, the background music was distracting, the instructor's speaking volume isn't consistent, the "coding" portions weren't done in a way that allowed me to follow along, code was presented with bugs and the instructor glossed over these with a simple "we'll fix those later". The theories were presented fairly well but really should have been condensed into a handful of lessons instead of spread out so broadly. It took me a few lessons to realize it, but the course notes - effectively power point slides that are hand written during the lecture - and the instructor's voice were recorded at different times. Multiple times through the lessons, the exact same portion is used repeatedly. Lecture notes are "rewritten" or explained again. This repetition is used ineffectively, as the instructor's voice isn't consistent within a single lecture. The repeated parts are either much louder or much softer than the surrounding lecture material. My biggest disappointment, though, was with the coding exercises. I was hoping for some hands on activities. Instead, the instructor spoke while the code - with all comments - was coded "live". The code was done quickly and offered no time for me to both code and listen to the explanation. Like the lecture notes, the code and the vocal explanation was recorded at different times. This means when a bug is encountered in the code, it is simply glossed over in the explanation as an area they will return to later to fix. This was incredibly frustrating. This course wasn't worth my time. The theory portions were just good enough that I stuck with it hoping to pick out something useful, but it never seemed to materialize. I did complete the course and don't feel I've learned anything that I can apply elsewhere. In the new year, I'll be looking for another machine learning course that, hopefully, is much better than this one.